Grab a brew and pull up a chair. 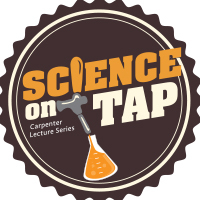 This evening lecture series features some of the best minds in science in a fun, social environment. From the sensation of being hugged by an octopus to quantum mechanics, Science on Tap looks to answer questions you never knew you had! Our Spring 2019 season has concluded. Check back soon for info on Fall 2019 lectures! April 11, 2019 - Dr. Mark Siddall - "Toxic Tales Through Time"
November 15, 2018 - Dr. Merlin Tuttle - "The Incredible World of Bats — Why We Need Them"
March 29, 2018- Dr. Takeshi Inomata - "Clues to the Origins of Maya Civilization Revealed"
November 2, 2017 - Dr. Justin Vandenbroucke - "Neutrino Astronomy at the South Pole"
September 28, 2017 - Mary Roach - "Grunt: The Curious Science of Humans at War"
April 27, 2017 - Jennifer Casey - "The Nature of Slow Food"
March 16, 2017 - Michael E. Mann, PhD - "The Madhouse Effect"